I find it hard to believe there is actually a word in the English language that could possibly describe what caregivers go through. There can’t be. What is experienced during the caregiving process is often a deep, emotional shift accompanied by confusion, frustration, even resentment for many. Somewhere along the line, one loses oneself and their individuality blurs with the needs of the loved one. Most are caregivers out of love and affection, and others caregive because it is not financially feasible to pay for professional care. Perhaps a child has a strong desire to care for mom and dad, or possibly a sense of obligation. They will caregive for as long as they can, only to surrender when they reach a point when they can no longer offer the quality of care the loved one really needs. It make no difference what the scenario is — all have experienced the same emotional labor. Who then will care for you, the caregiver? Ultimately the answer is you. We’ve all heard the saying: “You have to remain strong for those you care for, so please take care of yourself.” But are caregivers really taking the time to replenish their bodies, minds, and souls? If I were a betting lady, I would say no. As a dutiful daughter myself, I would, without thought, put my parents first at every turn, and would eventually become weak in body, mind and soul. Lost somewhere between raising children and tending to fragile parents, there is a place called limbo, and we must prevent ourselves from going there by anchoring to a solid, stable place. What I have learned along the way from my clients is that it is 100% necessary to tend to yourself. This brings with it the image of being on an airplane; the flight attendant talks about placing the oxygen over your mouth before assisting others. You do this because without you, others might perish. The strong one must get stronger (have oxygen) before helping those who aren’t strong. Place the mask over your face and “breathe.” The same is true when your feet are on the ground and you are a caregiver. It’s not difficult to look around and see that many of us are surviving by the skin of our teeth. There just aren’t enough hours in the day. Life is much more challenging in many aspects than it used to be, yet somehow we all seem to think it’s easier with our electronic gadgets close in-hand. With the onset of technology, such as smart homes, smart electronics, iPhones, latest and greatest cars, etc., shouldn’t our lives be easier? The cars are getting to the point of not even needing a driver (sooner than you think), our appliances do all the work for us, and our social media makes the world a much smaller place. So why aren’t we more rested? These things enable us to do more in a given day, but our days are just getting busier, not easier. Because gadgets break and malfunction, dishes still need to be put in cabinets when clean, and human interaction and input is required at every turn, it’s no wonder we are exhausted, distracted, and as a result, sometimes unproductive. But, we still beat ourselves up because we aren’t accomplishing enough! That’s a tiring cycle too! Imagine that coming from a young adult! I explained that every generation meets with it’s own challenges and difficulties. We had trouble back in the day, as well, but not like today where we are all traveling at warp speed, breaking our necks to get things done in a tizzy, and often the quality lacks because we aren’t taking our time to perfect anything. What a shame! Maybe I am slowing down a little because I am aging a bit. Maybe I am slowing down to recharge my batteries. It has become painfully clear to me, and even in watching some of my family, friends, and clients, that we are all carrying heavy bags, uphill, every day. It seems most of the actions and decisions we make are often driven by money, because money is important in this life; we have to make money to pay bills, our debts, etc. But at the end of the day, or when we are in the car driving, do we really have to check our texts, as though the world would stop if we didn’t respond? Can we just enjoy some music or our own thoughts for a little while? Unplugging for a little time each day may be a very good thing. It took me awhile, but I have made a decision that was not easy to come by; I’m not checking the phone past 5:00 pm. unless it is urgent. I will continue to help as many as I can during the day, while in the office, from the office phone and email, out in the field, etc., which I am always happy to do. But my spirit ( and I am betting, yours) is in need of a bit of renewal and restoration. No one will give me a break, but me! I guess I better start with the lady in the mirror. Today I exited my home and approached my car in the driveway. On top of the driver’s side mirror was a kooky little bird behaving in the strangest manner. It was completely enamored with its reflection in the mirror. Its little feet danced and it bobbed its head like crazy, joyous that it found an amiable friend … one that looks just like it! It was so preoccupied with its reflection that it was not deterred by my presence only 3 feet away. 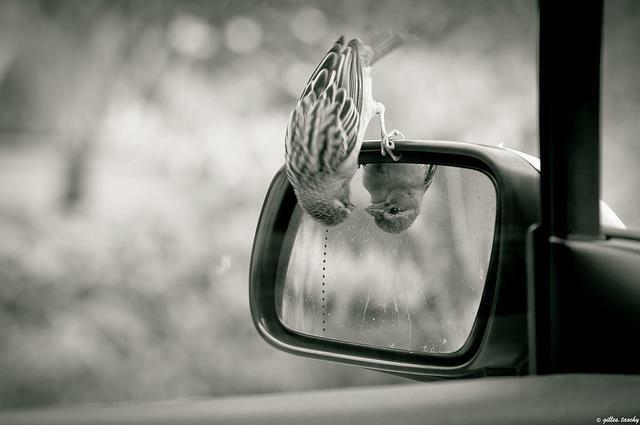 The next thing you know, the little bird side-stepped along the rim of the driver’s side mirror until he was completely upside down, flapping its wings and having a wonderful time looking at its new friend. Nature has always been amazing to observe. It teaches us lessons if we pay attention. Because of that looney little bird, I will look at myself with more enthusiasm from now on. How could you not smile when you witness something like that … a tiny creature with a Herculean spirit. An important lesson for us all. It seems we are all in relentless pursuit of happiness. Maybe we have trouble finding it because we are so busy in the actual pursuit of it. If you’ve ever watched a kitten chase its tail or a hamster on a wheel, that’s pretty much how I view society in general. We are always racing to get somewhere, but if we are smart, we will learn to step off the track and breathe for a while before getting back on. We need respite and renewal first. Our old cat, Tommy, was the teacher for this one. This past weekend, my family gathered around to watch a movie together. Halfway through the movie, I looked over at my elderly father who was fast asleep, and most surprisingly, the cat crashed next to him. Then the cat got up, stretched, and moved over to my daughter. 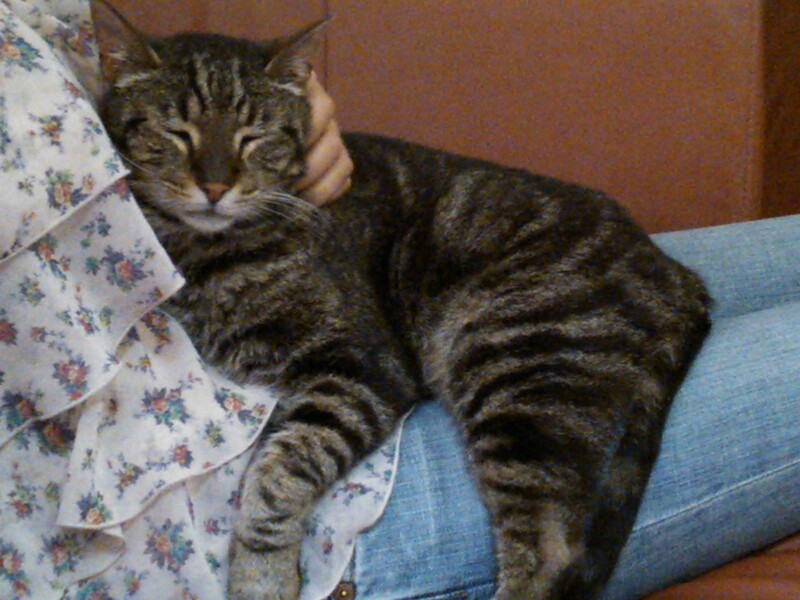 A true lap cat, Tommy is getting old, arthritic in his hips, getting thinner, and certainly not the fierce mouse hunter he once was. He used to stalk his territory and control the mole population. He used to leap in the air at falling leaves in autumn, and attack your leg as you were walking by. Incredibly vocal, he will tell you exactly what he needs when he needs it. But now, you could see youth was leaving him, yet he looked more contented than ever. Life is too short not to take cat naps. Happiness is found in simple things, like getting your back scratched. No worries if the work doesn’t get done this second. It will get done eventually. Kick back and dream about catching a big mouse. He loves and trusts unconditionally. I know our furry friends do not have the worries that we humans have, but if we go through life aware of what’s around us, we can learn a lot from nature’s intelligence! There’s nothing easy about letting go. Or feeling like we have no control. Or even having to face the truth about ourselves or a particular situation. So many questions unanswered … and so many more that come flooding in. It leaves our heads spinning. It seems these days, we all have a burden of some sort to carry. I have witnessed this through the families I work with, and even in my own personal life with an elderly parent who is ill. I often feel a bit stuck when I arrive at that “crossroad” and I am sure many of you feel the same way. Whatever the situation, we have choices we have to make and not always under optimal conditions. But we CAN do it, and do it well, even under the most stressful of times. We have to do it, because failure is NOT an option. We’ve come too far to let that happen. It took me almost 50 years to realize there are many things we have no control over. What other people do to themselves or impose on us, illnesses that defy explanation, why bad things happen to good people, etc. And sometimes the answers just don’t come when we want them to arrive. Mom used to call me “superwoman” and that was an appropriate title at the time. But somewhere along the line, I ran out of gas. Sound familiar? Much as I hate to admit it, I simply got tired, and I allowed life to wear me out … for awhile. Now I see too many people count on us, from our spouses to our kids, even our pets look to us! The bottom line is that WE should be counting on our “selves.” We possess the inner strength to confidently choose a direction. Standing at the edge of a precipice, someone from behind pushed me and I fell. I had two choices. Continue to fall or learn to fly. I flew well. There never seems to be enough hours in the day. If you are a caregiver, you know this better than anyone, for your schedule is not your own. Yet, I have heard many of my elderly clients say, “You must make the time because it is important to your well-being.” Here are some suggestions I have learned along the way that might bring some “oxygen” to your life, so you can breathe again. You’re all you’ve got! Make dates with your spouse and children to keep your sanity in check, and the bonds of relationships fresh. 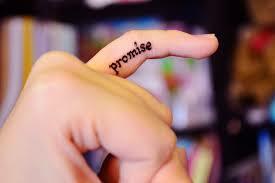 This is imperative, so make yourself a promise to do this. Rest and replenish, even if you have to steal private moments in the backyard, in prayer or meditation, or just sitting. If you are experiencing guilt, anger, jealousy, resentment, etc., seek the assistance of close friends, a counselor, your minister or rabbi. Realize that most of what you are feeling is perfectly normal. Know when to seek professional help, if you become depressed, anxious, or experience feelings that are not normal. Combat depression by finding time to engage in an activity that brings you pleasure — a walk with your children or grandchildren, writing in your journal, getting out to shop for 2 or 3 hours. Respite care is available in many communities, just so you can rest from caregiving. Pay attention to these things: sleeping, nutrition, exercise. Eat as well as you can; snack on fruits (natural pick-me-up) and granola bars, plus plenty of water. The brain is less tired when hydrated and your organs love it too. Sleep is one of the first things we miss in stressful situations. Instead of relying on sleep aids, try listening to soothing music, curling up with a good book, and cutting down on caffeine. If your loved one is napping, pop a yoga DVD into the TV and do some stretching; very invigorating. Better yet, if you can get away for an hour, go get a massage. Listen to music during the day, preferably easy listening, classical, or other calming music. Spiritual self-care: make time for reflection and spend time with nature. Stay connected to your faith-based organization, or consider joining one. Be open to inspiration that will come from others. Surround yourself with kind and loving people. As a dutiful daughter myself, I would put my dad first at every turn, and would eventually become weak in body, mind and soul. Lost somewhere between raising children and tending to fragile parents, there is a place called limbo, and we must prevent ourselves from going there by anchoring to a solid, stable place. What I have learned along the way from my clients is that it is 100% necessary to tend to yourself. This brings with it the image of being on an airplane; the flight attendant talks about placing the oxygen over your moutn before assisting others. You do this because without you, others might perish. The strong one must get stronger (have oxygen) before helping those who aren’t strong. Place the mask over your face and “breathe.” The same is true when your feet are on the ground, and you are a caregiver. Next week, I have some specific suggestions to offer for the caregiver to administer “oxygen” to themselves first.